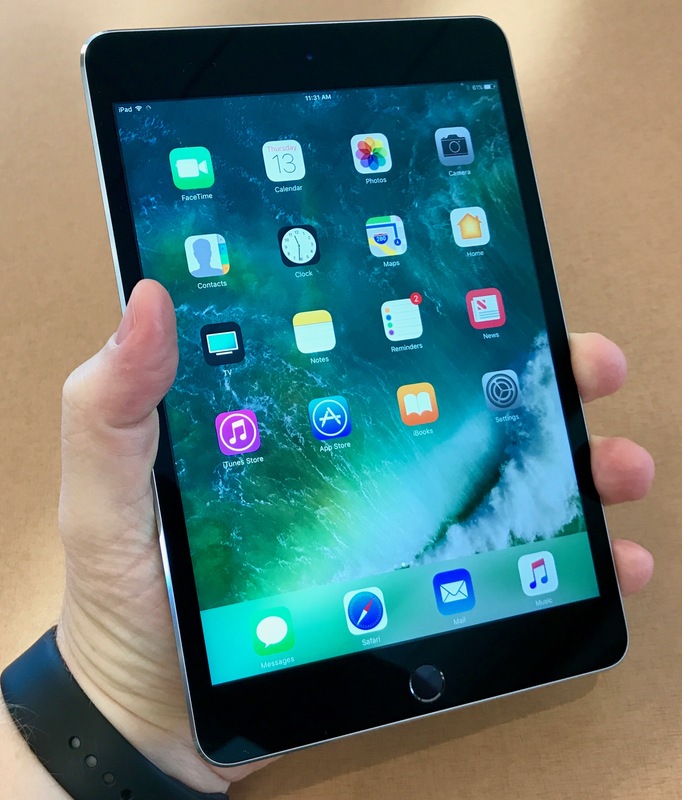 Apple recently lowered the price of the 128GB iPad mini 4 knocking $100 off the price while also introducing a new 9.7-inch iPad at an amazing introductory price of $329. 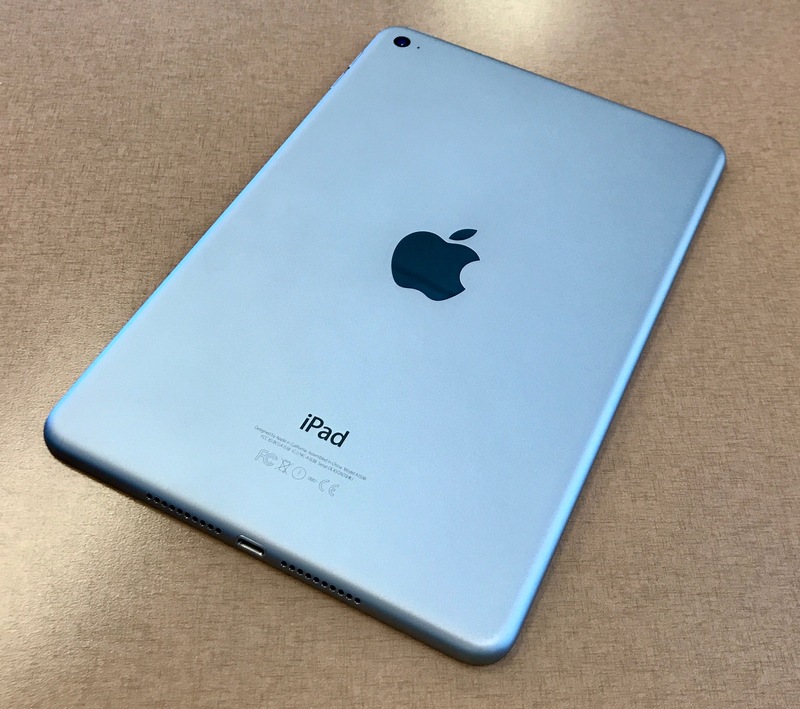 However, does the new lower cost of the 128GB iPad mini 4 make it a compelling purchase? This review will look at the iPad mini 4 and give buyers advice on whether it’s worth the price even at the lower cost. 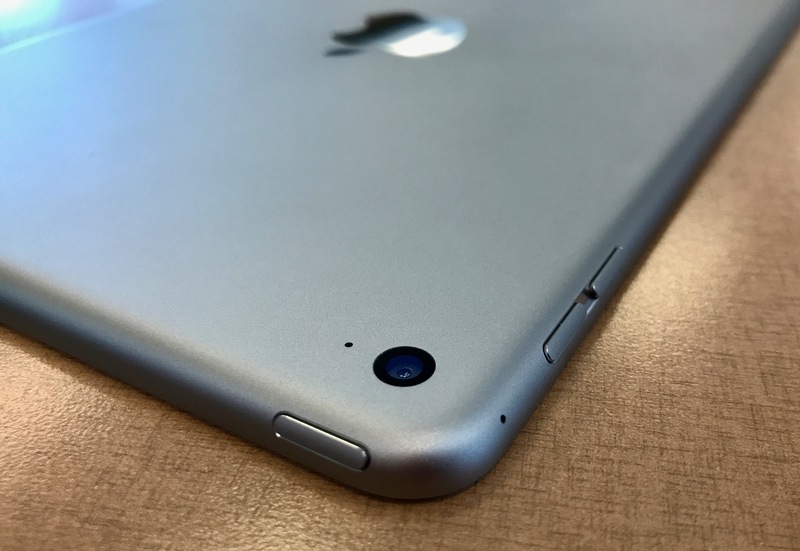 The iPad mini 4 first showed up back in September 2015 and then got a lot of attention. Since it’s original launch, Apple hasn’t updated it or added new features. However, they did recently drop the 32GB model and offer the 128GB iPad mini 4 for $399, $100 less than it used to cost. We decided to take a second look at the tablet. 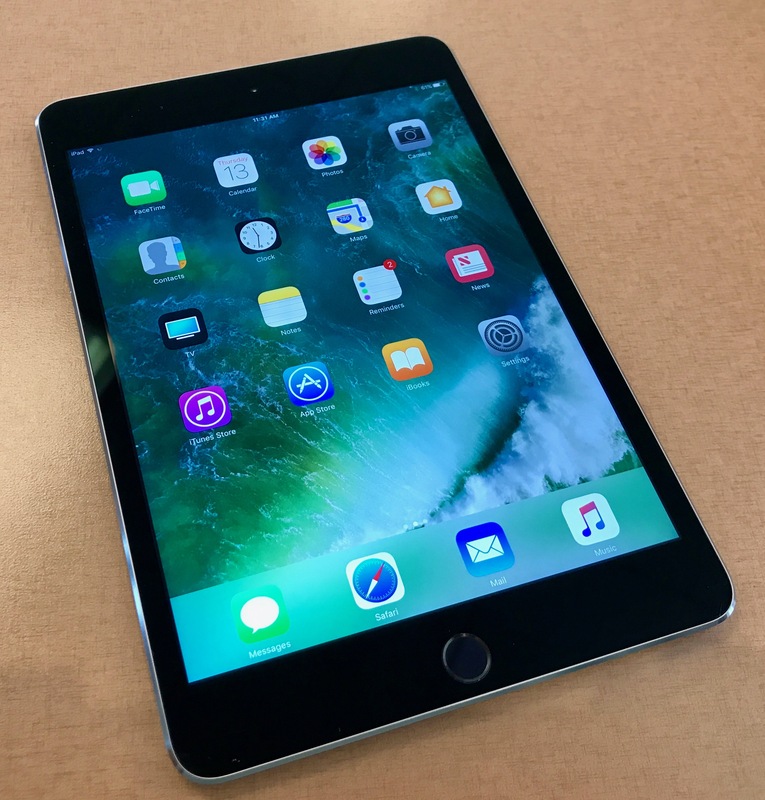 Should potential iPad buyers opt for the cheaper mini or go with the new 2017 iPad just introduced at an even lower price of $329? 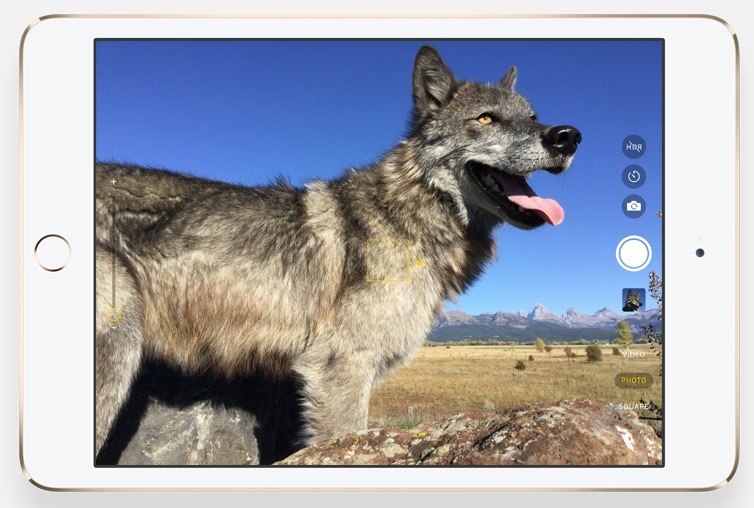 The iPad mini 4 has a nice 7.9-inch display with a 2048 x 1536 resolution. That’s 326 pixels per inch (ppi). It’s a beautiful bright display with a colorful look delivering faithful color rendering. 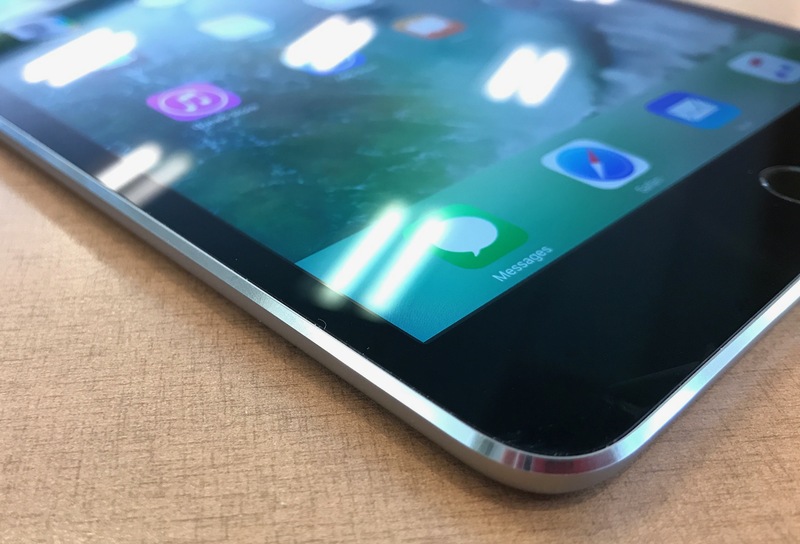 The new 2017 iPad has the same resolution as the iPad mini 4, which means it has a lower pixel-per-inch resolution. It only delivers 264ppi making it less crisp, in theory. I couldn’t tell a big difference between the two despite the pixel per inch difference. 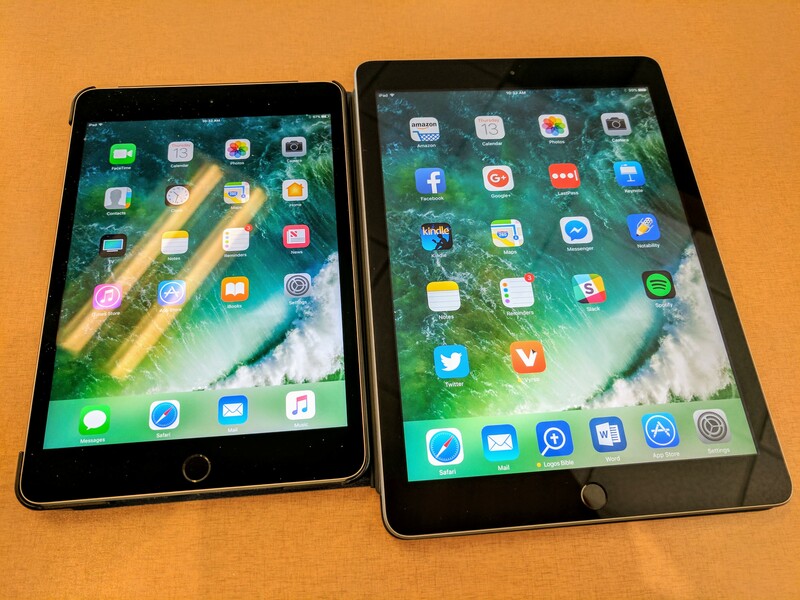 The smaller iPad uses older A8 and M8 processors while the new iPad enjoys faster speed with Apple’s A9 and M9 processors. They’re both 64-bit, so they’ll work fine with the new 64-bit only iOS coming out later this year. They both include 2GB of memory to run programs. 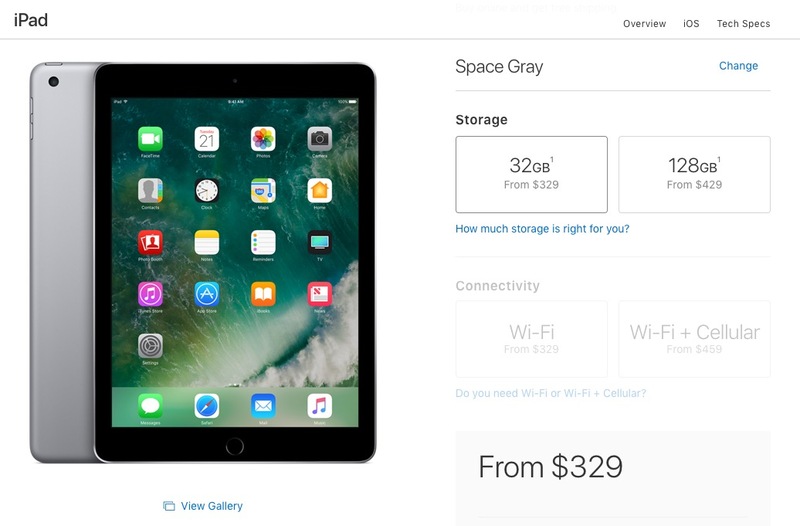 The new 2017 iPad sells for $329 with only 32GB of storage built-in. 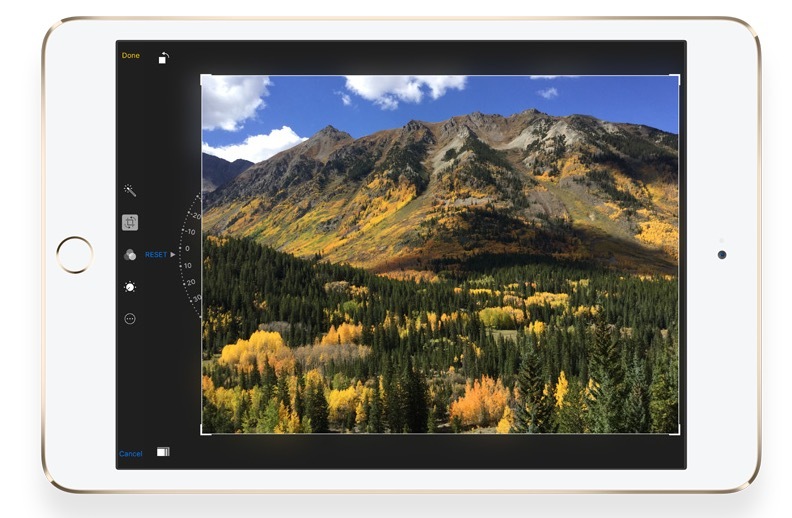 The larger iPad offers a smaller 32GB storage option at the base price of $329. The 128GB model costs $429 making it just $30 more than the 128GB iPad mini 4. 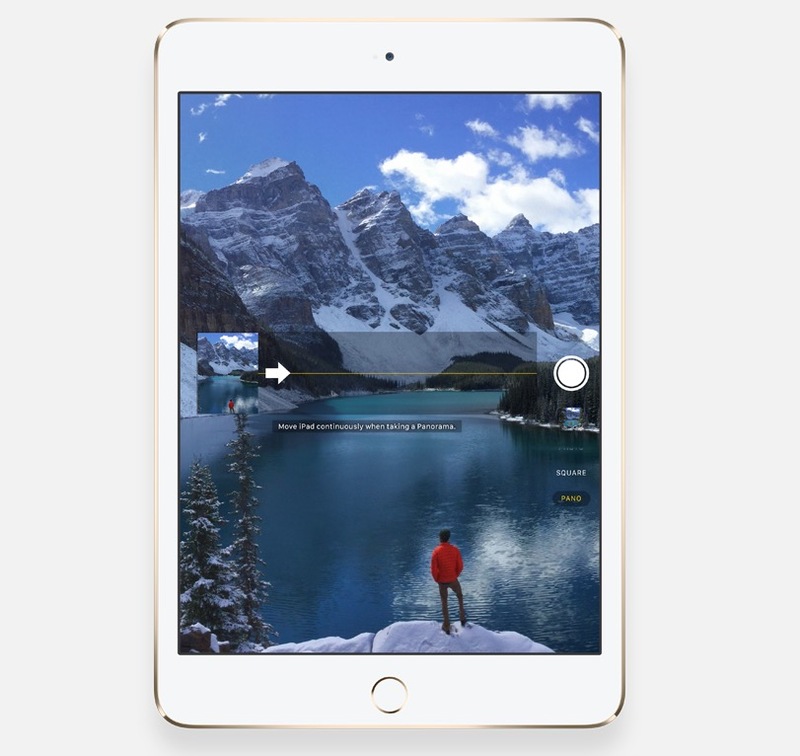 The older iPad mini 4 drops the 32GB model and starts at $399 for 128GB of storage. The speed difference between the two iPads doesn’t show up in daily use and in the basic apps that I used. The newer larger iPad does boot a couple of seconds faster than the iPad mini 4. Most people won’t notice enough of a speed increase to matter. The iPad mini 4 weighs 299 grams while the larger 2017 iPad weighs 469 grams making it just over 50% heavier. The new 2017 iPad measures 7.5mm compared to 6.1mm for the iPad mini 4. Those numbers mean that the bigger iPad does weigh more and feel thicker, but not enough to make that a serious consideration. The screen size will matter. The larger 9.7-inch screen makes it easier to see the same thing on the screen compared to 7.9-inches in the iPad mini 4. However, it will feel bigger and might offer less convenience for reading in bed at night or carrying around. Smaller means more portability, while bigger means easier viewing of video, images and text. I love using an 8-inch tablet for reading, quick Internet browsing and checking email. I especially love using it for taking notes in meetings or classroom settings at professional development training workshops. It’s small and convenient. A good fine-tip stylus like the Adonit Dash 2 ($49.99 direct) works almost as well as the Apple Pencil on the iPad Pro. 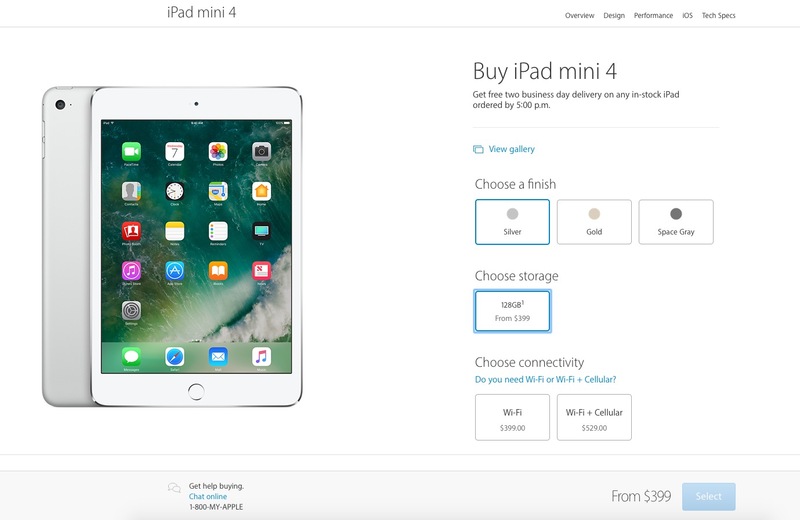 Apple sells the iPad mini 4 in Silver, Space Grey and Gold. I prefer the more conservative Space Gray look. Apple put the fast and reliable Touch ID Home button on the iPad mini 4. It’s quick and easy to open the iPad with it. The boring iPad design won’t get anyone excited anymore. We’re used to the rectangular slabs of glass, metal and plastic. The brushed aluminum edges with rounded corners feel good in your hands. Like all Apple tablet and phone designs, it screams quality and efficiency. The buttons for power along the top right corner and volume along the upper right edge feel sturdy. They should last and in my experience don’t wear out after normal usage even after more than a year of usage. I’ve only had this iPad for a short time, but it feels no different from other iPads I’ve owned for more than a year. Fortunately, we still get a headphone/mic combo port on the left end of the top edge. Sound is great through the headphones and adequate using the speakers along the bottom edge. Apple still maddeningly uses their proprietary Lightning port for charging and syncing. It’s a USB-C world and they need to change to the new standard especially since, they’ve added the faster and more reliable USB port to their MacBooks. Not many people will use their iPad camera as much as their iPhone or smartphone camera. Apple gave the iPad mini a decent 8MP camera. It’s not the same as the iPhone 7 or 7 Plus camera, but it’s still pretty good for a tablet. Taking photos with a large 7.9-inch electronic view finder feels more satisfying than one might think. It’s easy to hold the iPad mini for stable shots since you can grip it with two hands. When you finish shooting photos, you can use the built-in editing features to improve them. Apple offers a great system where third-party apps can add editing features to the built-in camera app to enhance photo editing. I use my tablet camera to scan handouts in meetings. Grab a snap of the page and import it into your note taking app. Grab a shot of the whiteboard to save class notes or meeting brainstorming sessions. The iPad mini 4 camera excels at this. Apple iPad offers the best tablet camera available. That makes it useful if you have to use it to get snapshots or scan documents. The iPad mini 4 easily wins the award as the best overall 8-inch tablet. It’s not the least expensive and other tablets might prove themselves a better option for some people. For example, if you mostly want to read books and watch video on Amazon or Netflix, get the Amazon Kindle, which costs about one-eighth the price of the $400 128GB iPad mini 4. However, almost everyone else should opt for the iPad mini 4. People heavily invested in Android might want to consider something like the smaller Samsung Galaxy Tab S2. The new Samsung Galaxy Tab S3 tablet doesn’t come in the smaller 8-inch size. Budget conscious buyers who want more than a digital reading device (Kindle) should look at either the iPad mini 4 or the new 2017 iPad. If you want a smaller and more portable tablet, then go with the mini. However, if you want something bigger, obviously go with the new iPad. The mini costs only $30 less than the new 2017 iPad with128GB, so price isn’t much of a concern. If you won’t install many apps, then the cheaper 32GB 2017 iPad will save you $70 over the 128GB iPad mini. We don’t recommend that you buy that one since it fills up quickly.